I’ll start this with the bottom line: A VOLUMIZED MUSCLE IS AN ANABOLIC MUSCLE. That means it is willing and able to grow. So…you wanna grow faster? Ok! 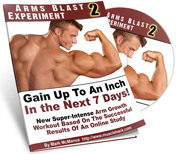 I’m about to tell you 5 ways to create MASSIVELY volumized muscle cells for the best gains of your life! (1) GET A MASSIVE PUMP! Pumps are great! But they’re not just cosmetically great. When we train correctly for hypertrophy, we increase blood flow to the areas AROUND and OUTSIDE the muscle cells. So we temporarily balloon up! This is the pump we all love (technically called “Reactive Hyperemia”). 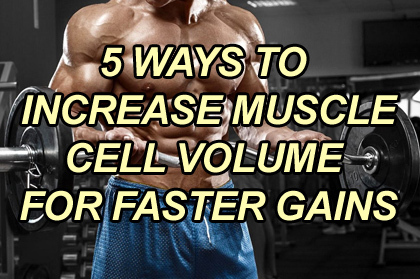 Ok, but increased muscle cell volume refers to increased fluid WITHIN the muscle cell. So what happens? It’s a complex process that could take pages to explain, but basically the work of 2 x transporter proteins in the cell membrane can cause increased cell volume during a skin-splitting pump. 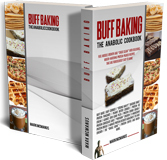 Bottom line: GET PUMPED – GET ANABOLIC! Due to the rep range, constant tension, and working to positive failure involved in my Targeted Hypertrophy Training (THT) you will experience crazy pumps! And faster-than-average growth! 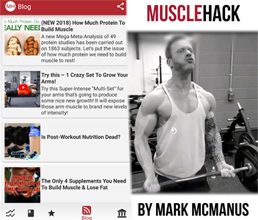 So download my totally free 3-day and 5-day/wk THT training routines; just enter your details below for immediate download it’s got everything you need for the best gains ever in the shortest amount of time! Constant tension simply means keeping a muscle working throughout the full range of motion and from rep 1 until you reach positive failure (most of the time that should be somewhere between the 8th and 12th rep). A lot of people are training in such a way that takes tension off the muscle during a set. That’s a big mistake because keeping tension on the intended muscle from one rep to the next is what FORCES the body into recruiting more and more muscle fibers. With each successive rep, the weight feels heavier, you lose a little strength, and your body tries to compensate for this by recruiting more and more muscle fibers – and get this – more and more of the TYPE 2 FIBERS – the ones mostly responsible for size gains. Don’t rest during a set. Keep the bar moving and lower the weight more slowly than you lifted it to keep tension on the muscle. Certain exercises like a dumbbell pullover will take tension off the intended muscle – that’s why I don’t recommend it. And certain modes of training – like Crossfit – just ignore this principle. That’s fine so long as your goal is general fitness. It’s not fine if you really want to grow. 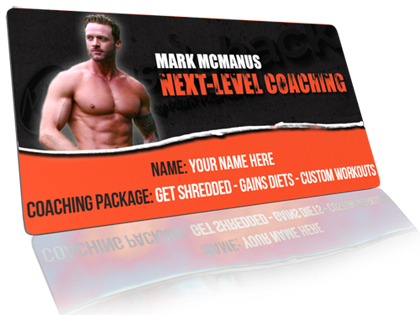 BY THE WAY: If you’ve at least a year’s training experience, Advanced THT Training takes this all to a whole new level with 9 x Advanced Strategies that literally FORCE new gains to occur. Your body will be left with no other option but to grow. Creatine VOLUMIZES muscle cells. It’s that simple. Creatine will allow you to complete more reps because it puts extra Creatine Phosphate into your muscles. But this also pulls more water into the cell. A volumized or hydrated muscle cell is a much more anabolic cell! So supplement with creatine. 5g per day will get the job done (after loading with 20g per day). You will simply build more new muscle. And you should definitely take creatine when on a shredding diet – it will help tremendously with keeping your hard-won gains! My creatine brand recommendation? MyProtein Creatine and AST Creatine (US links). MyProtein Creatine and AST Creatine (UK links). 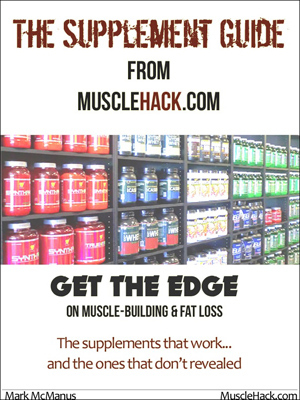 NOTE: If you want to know the TRUTH about all other popular supplements out there and are confused as to which ones actually work, I created a FREE supplement guide for you! It reveals all the supplements that work, the ones that don’t, it’ll save you a lot of money! So I stated in the creatine section above that a hydrated muscle is an anabolic muscle. So the next recommendation should be obvious. Get enough water every day! Make sure you’re not dehydrated! So a 180lb person needs 108 ounces of water daily. That’s around 13 x 8 ounce cups. Maximizing cell volume and nutrient uptake into the cell requires sodium. Don’t be afraid of sodium. Don’t be afraid of salt. If you eat real food, you can’t possibly overconsume it. I cook all my food and I shake salt over every single meal I eat. I probably take in about 5-6g per day. That’s all you really need to do. Do all 5 of the above and I promise you’ll make better gains. Since it’s the beginning of a new month, start today and see if you don’t see noticeable new gains by the end of May.